Beatles or Elvis? Lemonade or limeade? I am a deeply committed limeade person. I don’t dislike lemonade, but it’s just… missing something that I can’t quite put my finger on. Maybe it’s too sour or maybe it’s missing the sort of floral note from the lime zest, but whatever it is, I love limeade. 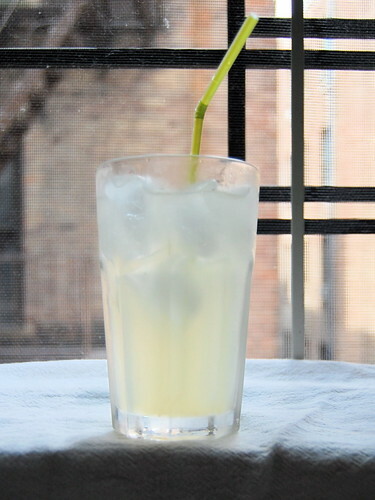 Based almost entirely on this recipe from Red Bird Crafts, this is possibly the most perfect limeade ever. Why? Because it’s a syrup, which solves two limeade problems for me. 1. I like my limeade pretty strong but my husband and kid like it more dilute, so this allows us all to customize our limeade. 2. This makes a lot of limeade without taking up a huge amount of space in the fridge. Bring water, sugar and lime zest to a boil and let simmer for 5-7 minutes. Strain, if desired. Add sugar solution to lime juice. Let cool. Add 2-4 tablespoons syrup to 12 ounces ice water (or as desired). The juiciest limes have smooth, thin skins and are heavy for their size. If they’re a little yellow, that’s fine. In order to get the most juice possible from a lime (or any citrus fruit), juice them with a wooden citrus reamer. Plastic and metal reamers slide around, but wooden ones have a nice amount of grip to get all the juice out. ← Not exactly about food, but still pretty great. Mmmm, I love them both equally….limeade & lemonade, I mean. I’d take the Rolling Stones over the Beatles tho. I’ve never tried to make my own lemon/limeade before, maybe I will. I like them in the Italian soft drinks that may be had at Trader Joe’s, by themselves or with a filtered vodka. KP: It was the first “annoying either/or question people put on Facebook posts” questions that sprang to mind. I’d pick The Who over both put together, personally. XN: It’s really ridiculously easy and really pretty cheap. Limes are 10 for $1 here, and even using 2 cups of Whole Foods’ vegan sugar, the entire batch still works out to less than $2.50 for a good amount of syrup. Yeah, I was just going to add – it’d be Beatles vs Rolling Stones. And if i were stuck on a desert island with one or the other, it’d be the Beatles. Oh, plus? My sister wrote a cookbook in which she said it’s ALWAYS better to go with lime. It scares people. I agree. Thank you for this recipe! My syrup is cooling as I type this!